February | 2014 | eat. drink. fly. I have an exiting new toy! 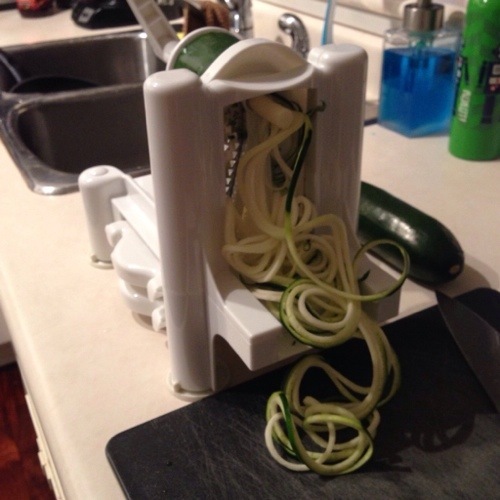 my spiralizer. I’ve been reading about these devices for years… but it always seemed like such an unnecessary novelty that I didn’t have room for in my limited kitchen space. 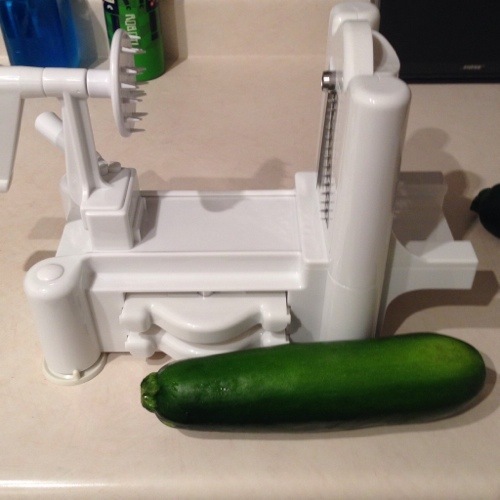 but, finally the temptation of being able to make a mountain of perfect zucchini noodles in seconds wore me down. and I have zero regrets. I bought mine on amazon.ca for about $20 and for that price I figured that even if I use it for a couple months and then ditch it, I still will have my money’s worth. but ya. I’m addicted. 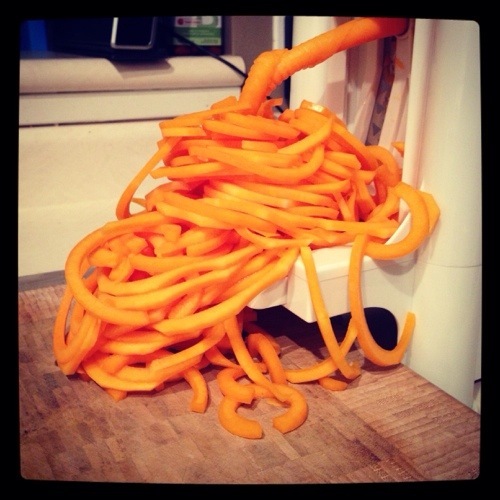 everything gets spiralized now! zucchini is the obvious starter. it’s cheap, good for you and makes delightful noodles. I have also recently made friends with orange noodles… butternut squash and sweet potato work wonderfully. those ones pictured above I cut a slit into pre-slicing so that the noodles would come out macaroni-like for a mac & cheese dish. I’ll post that full recipe and pics later, but it was delish. the only warning I’ll give is that it takes a little practice to tweak recipes for veggie noodles to compensate for the water content in the vegetables. but it’s such an easy and delicious substitute for terrible-for-you processed carbs. on valentines day we feasted on zucchini pasta with homemade pesto as a base for some seared scallops. I wish I had take a picture, but it was so tasty it was immediately consumed. and follow me on instagram at vancityrockgirl for lots of food pics. all this cold winter air and snow on the ground is putting me into vacation mode… and 2014 is going to be a leaner year for vacation for me, which while a little sad, isn’t the end of the world. I’m sure 2015 will make up for it. the grand plan for 2014 has two guaranteed trips, and I know this because flights are bought already… I’ll be cruising the eastern caribbean in a few months and heading back to austin in October. 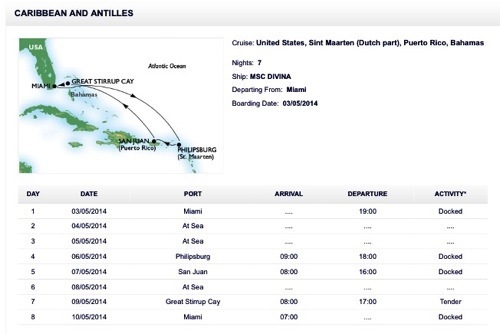 in May I’m off to Miami to board the MSC Divina and spending 7 nights on a work vacation. meaning it’s technically work, with days spent in conference rooms, but still with free time (including in port) and getting to enjoy a balcony cabin with my work roomie. I’m really excited to see some new places, including Puerto Rico! I’ve been to the Bahamas before, but to Nassau, so these are all new stops for me… including the port of Miami. I watched a doc called Cocaine Cowboys the other day and it was centered in Miami and showed some crazy stuff… but I’ve heard Miami is a pretty rad city, so I’m excited to spend a night there before my cruise. my flight won’t get me in until late so most of my Miami time will be in the morning, so if anyone’s been and has a breakfast/morning wander suggestion, I’m staying at the Hyatt Regency and would love to hear it.